The analysis can be used to help decide almost any course of action, but its most common use is to decide whether to proceed with a major expenditure. Since it's based on adding positive factors and subtracting negative ones to get a net result, it is also known as "running the numbers." A cost-benefit analysis finds, quantifies, and adds all the positive factors involved in a proposed course of action. These are the benefits. Then all the negatives, or costs, are identified, quantified, and subtracted. The difference between the two indicates whether the planned action is advisable. The real trick to doing a cost-benefit analysis well is making sure you include all the costs and benefits and properly quantify them. Should we hire an additional sales person or assign overtime, or will we be better off putting our free cash flow into securities or investing in additional capital equipment? Both of these questions can be answered by doing a proper cost-benefit analysis. Say you are a production manager and you are proposing the purchase of a $1 million stamping machine to increase output. Before you can present the proposal to the vice president, you need some facts to support your suggestion. You need to do a cost-benefit analysis. First, you list the benefits. The machine will produce 100 more units per hour. The machine will replace three workers currently stamping by hand. The units will be of higher quality because they will be more uniform. You calculate the selling price of the 100 additional units per hour multiplied by the number of production hours per month. Add another two percent for the units that aren't rejected because of the higher quality of the machine output. Then add the monthly salaries of the three workers. That's a pretty good total benefit. Then there are the costs. The machine costs $1 million and it will consume electricity. That's about it. You calculate the monthly cost of the machine by dividing the purchase price by 12 months per year and divide that by the 10 years the machine should last. The manufacturer's specs tell you what the power consumption of the machine is and you can get power cost numbers from accounting. You figure the cost of electricity to run the machine and add the purchase cost to get a total cost figure. You subtract your total cost figure from your total benefit value and your analysis shows a healthy profit. You're ready to present your analysis to the vice president, right? Wrong. You've got the right idea, but you left out a lot of detail. Take another look at the benefits first. Don't use the selling price of the units to calculate the value. The sales price of any item includes many additional factors that will throw off your analysis if you include them, not the least of which is a profit margin. Instead, get the activity-based value of the units from accounting and use that number. You added the value of the increased quality by factoring in the average reject rate, but you may want to reduce that a little because even a machine won't always be perfect. Finally, when calculating the value of replacing three employees, be sure to add overhead costs and benefits costs in addition to their salaries. Accounting is your source for the exact number of the company's "fully burdened" labor rates. You may have overlooked other details. For instance, you may be able to buy feedstock for the machine in large rolls instead of the individual sheets needed when the work is done by hand. This should lower the cost of material, another benefit. Now reconsider the costs. In addition to its purchase price and any taxes you will have to pay on it, you must add the cost of interest on the purchase. Even if the company buys the machine outright, you will have to include a sum in the lost interest it would have earned if the money had not been spent. Check with finance to find out the amortization period. The machine may last ten years but the company may not keep it on the books that long. It may amortize the purchase over as little as four years if it is considered capital equipment. If the cost of the machine is not enough to qualify as capital, the full cost will be expensed in one year. Adjust the monthly purchase cost of the machine to reflect these issues. There may still be some details you overlooked. Floor space: Will the machine fit in the same space currently occupied by the three workers? Installation: What will it cost to remove the manual stampers and install the new machine? Will you have to cut a hole in a wall to get it in or will it fit through the door? Will you need rollers or machinists with special skills to install it? Operator? Somebody has to operate the machine. Does this person need special training? What will the operator's salary, including overhead, cost? Environment: Will the new machine be so noisy that you have to build soundproofing around it? Will it increase the company's insurance premiums? Once you have collected all the positive and negative factors and have quantified them you can put them together into an accurate cost-benefit analysis. Some people like to add up all the positive factors, then add up all the negative factors, and find the difference between the two. Others prefer to make a running list that combines both factors. That makes it easier for you or anyone reviewing your work to see that you have included all the factors on both sides of the issues. 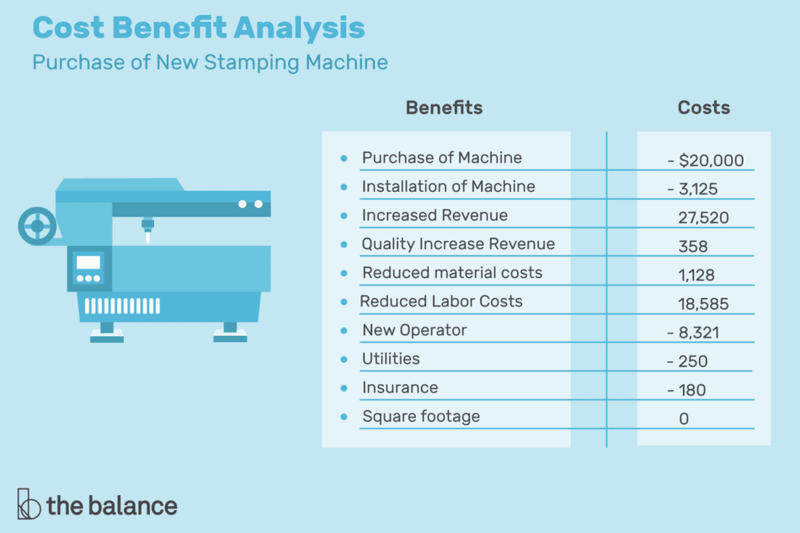 Your cost-benefit analysis clearly shows the purchase of the stamping machine is justified. The machine will save your company more than $15,000 per month, almost $190,000 a year. This is just one example of how you can use a cost-benefit analysis to determine the advisability of a course of action and then support it with facts.